Imagine this scenario: Annual physical examinations are supplemented by an affordable home diagnostic chip, allowing you to regularly monitor your baseline health with just a simple urine sample. Though outwardly you appear to be in good health, the device reveals a fluctuation in your biomarker profile, indicating the possible emergence of early stage cancer development or presence of a virus. Diagnostic devices like a home pregnancy test have been around since the 1970s. It revolutionized a woman’s ability to find out if she was pregnant without having to wait for a doctor’s appointment to confirm her suspicions. The test relies on detecting a hormone, human chorionic gonadotropin, present in urine. But could detecting cancer, or a deadly virus, from a similar kind of sample and device be as simple and non-invasive? 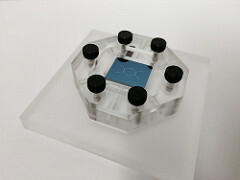 Over the last couple of years, a cross-disciplinary team at IBM Research led by Dr. Joshua Smith, research scientist and master inventor, and Dr. Gustavo Stolovitzky, program director of IBM Translational Systems Biology and Nanobiotechnology, have been exploring this idea by retooling silicon technology and using it to separate nanoscale-sized particles like the elements of viruses and cancers. 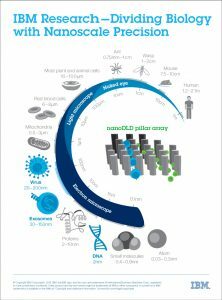 The answer lies at the intersection of human biology and nanotechnology. First, you need a “liquid biopsy,” which can be obtained from urine or saliva samples. Then the nanometer-tiny biomolecules need to be separated for downstream detection of a disease, even while its presence is physically undetectable. Today’s separation techniques require expensive equipment, a biochemistry lab, and trained technicians, making regular screenings impractical. But a chip-based nanotech approach could offer a simple and affordable option to enable physicians to potentially detect and monitor a disease, even at its earliest stages, long before physical symptoms manifest and when the prognosis for treatment options is most positive. It’s the holy grail for medical professionals: treat people before they get chronically sick. The team’s big advantage is combining state-of-the-art nanotechnology and fabrication techniques with computational biology expertise. This potent synergy is difficult to come by in other research laboratories. Separating bioparticles is by no means a new concept, but in their latest experiments, Smith and Stolovitzky’s team is the first to have successfully separated nanoscale biomolecules – specifically exosomes (cell-derived vesicles found in bodily fluids containing genetic cargo released from the mother cell) down to just 20nm in diameter, roughly 1/5,000th of a human hair. At this scale, a host of important bioparticles can be separated, including the aforementioned exosomes, DNA, viruses, and protein complexes, which can potentially signal the early onset of a disease state, existence of a virus soon after exposure, or be used to monitor disease progression. Using a technology called nanoscale deterministic lateral displacement, or nanoDLD, a liquid sample can be passed, in a continuous flow, through a silicon chip especially designed with an asymmetric pillar array. This array allows the system to sort a microscopic waterfall of particles, separating particles by size down to tens of nanometers resolution. Separation occurs as smaller particles move in a zig-zag motion in the direction of the fluid, while larger particles bump through the array along the direction of pillar asymmetry, like truck drivers forced into the truck lane on a freeway, allowing materials of different sizes to be isolated for downstream detection or analysis. As part of its on-going development for this technology, IBM Research is collaborating with a team from Mount Sinai Health System, led by Carlos Cordon-Cardo, MD, PhD, Chair of the Department of Pathology at the Mount Sinai Health System and Professor of Pathology, Genetics and Genomic Sciences, and Oncological Sciences at the Icahn School of Medicine. The collaboration brings together Mount Sinai’s domain expertise in cancer and pathology while IBM Research brings its bioinformatics experience and its latest nanoscale separation technology. In the war on cancer, exosomes are increasingly being viewed as useful biomarkers for the diagnosis and prognosis of malignant tumors. Exosomes are released in easily accessible body fluids such as blood and urine, and represent a precious biomedical tool, as they can reveal the origin of a cancer. “We have realized that cells talk to themselves by sending messengers. Some of these messengers are stored and transferred inside various small vesicles or exosomes. We have learned that inside of these envelopes a lot of critical information can be found, including those encoded by proteins, or even our own cell’s messengers in the form of DNA-gene fragments and RNA molecules,” Cordon-Cardo said. Cordon-Cardo is motivated by the opportunity to use the information carried within exosomes to get ahead of diseases. Cordon-Cardo believes that with IBM nanoDLD technology, experts can more effectively eavesdrop on the messages being sent between cells and organs in a way that is noninvasive. Monitoring this intercellular conversation more regularly would allow experts to act as a virtual chaperone, carefully observing until the time comes when either the condition has reversed and the patient has returned to a healthy state, or allowing doctors to decide that something more invasive is justifiably needed. 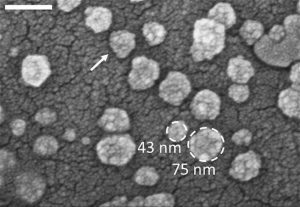 Electron micrograph of exosomes on a surface. “When we are ahead of the disease we usually can address it well; but if the disease is ahead of us, the journey is usually much more difficult. One of the important developments that we are attempting in this collaboration is to have the basic grounds to identify molecular signatures that can be there very early on,” he said. IBM Research and Mount Sinai plan to test the nanoDLD technology on prostate cancer, the most common cancer in men in the US. In prostate cancer, doctors recommend that men older than 50 have a yearly test for a prostate specific antigen (PSA) taken from a blood sample. However, having an elevated PSA level doesn’t necessarily mean a person has or will get prostate cancer. Conversely, not testing positive for PSA doesn’t preclude an individual from forming prostate cancer either. The hope is to look for specific, sensitive biomarkers, and exosomes today represent a new frontier offering clues that might hold the answer to whether a person has cancer. “With exosomes you get a glimpse of what a cancer cell is processing. 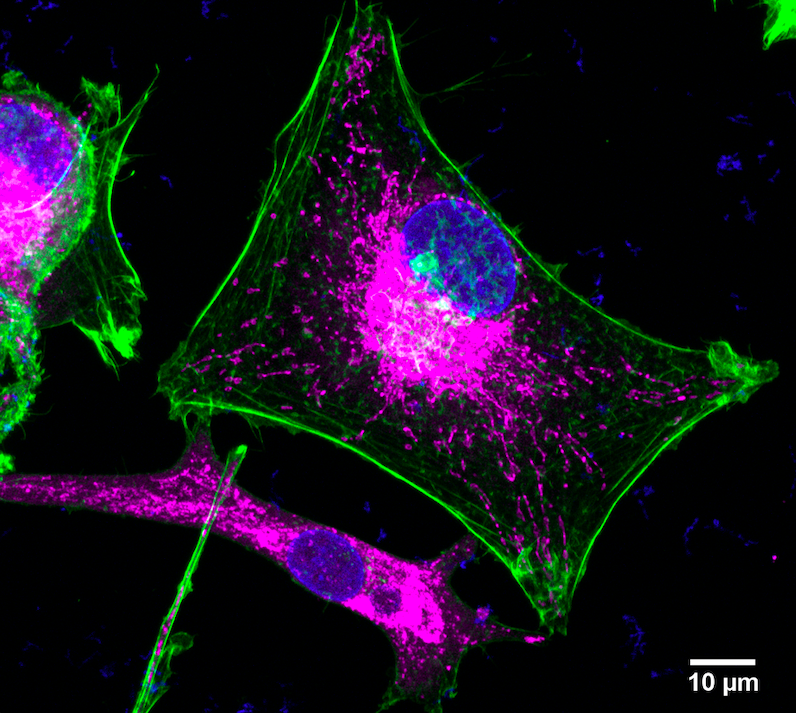 Cells shed exosomes all the time. If we detect them we can see what is inside without touching the cancer,” Stolovitzky said. Right now, the research is still in its earliest stages. The IBM Research team’s latest scientific results were published today in Nature Nanotechnology*. As part of next steps, the team hopes to increase the volume and throughput of what the device can handle and to engineer the device so it can separate bioparticles smaller than 20 nanometers, thus taking them into the realm of individual proteins. They also plan to confirm their device is able to pick up the kinds of biomarkers they’d expect to see in the exosomes of prostate cancer patients, and will continue to work on building a clinical-grade prototype device. Clinical trials would be required before a device could reach the market. But just like the pregnancy test changed the game for expectant women, some day in our future we might be able to use a simple point-of-care device that gives us tell-tale signs of our health before we even notice any symptoms.